Fixed dentures represent the newest alternative to removable dentures by combining traditional denture technology with modern advancements in dental implants. A full fixed denture is a full set of teeth affixed to the jaw using multiple dental implants. The fixed denture is custom fitted to sit securely in place to instantly increase retention, stability, and comfort. Full fixed dentures eliminate the problems associated with removable dentures. Being anchored into living bone tissue with titanium implants, the fixed denture provides the stimulation and support needed to prevent or minimize further bone loss. The wearer is no longer concerned about their denture having to be refitted, removing it to clean, or the denture coming out at a very inopportune moment. This means you can eat with greater confidence, speak without a slur, and throw away the jar, denture cleaners, and adhesives in your bathroom. We are happy to offer our patients full fixed dentures as a treatment option. This system looks and feels more like natural teeth and will enhance not only your smile but also your confidence. If you’re tired of living with removable dentures, call us at 720-488-7677 for a consultation with Denver Prosthodontist Dr. Aldo Leopardi of DenteVita Prosthodontics. Full fixed dentures could be the right solution for you. We offer full fixed dentures in the Denver, Colorado area. We are located in Greenwood Village, Colorado. 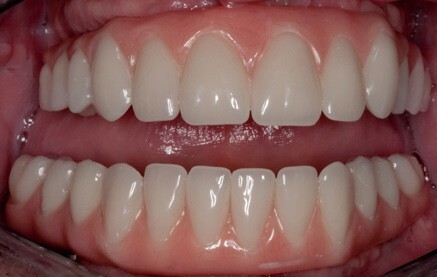 Before: Failed upper and lower remaining teeth. Patient elected to proceed with Phase I immediate upper and lower complete denture therapy with the view toward phase II implant therapy. After: Definitive, fixed, acrylic fused to metal, screw-retained (retrievable) upper and lower hybrid restorations. Supported by 8 Maxillary (upper) and 7 Mandibular (lower) root form titanium dental implants. Treatment outcomes included improved function (100% bite-force), mastication/diet, aesthetics and enhanced quality of life.